This is Your Life: Revamped! It was impossible to have this not be a priority. Among many, many cans of film, The JAM Project has possession of Jeanette’s original of This is Your Life — the one that they say at the end of the show that they’re giving her. The film strip is dated and stamped — this is it. The wrapping the film is in is labeled in Gene’s handwriting; the reel itself is labeled in Jeanette’s. If you don’t think that is ridiculously cool, WHY are you reading this blog!?!? So anyway, it didn’t take a rocket scientist to know that every “version” of this show currently out there is grainy, gritty, blurry, etc — we’ve all been happy to have it, of course, and memorized it and loved it and watched it over and over again, anyway, but if there was a chance that a better copy could be made with the technology available to us in 2017, we had to look into that, especially considering its significance in the Jeanette and Nelson story. Jeanette’s film looked to be in remarkably good shape for being almost sixty-five years old. We knew this transfer was going to be expensive, but we marshaled the troops and got it done — and it’s digital now, so it’s forever. What a coup. That feels awesome. Beyond my ongoing gratitude to Lynda, Mary Lynn and Angela for making The JAM Project a reality, I want to make sure we also express our tremendous thanks to the people who helped with the financing of This is Your Life specifically, to make it available for everyone to enjoy at no cost: Leslie, Tracy, Charlotte, Annette, Scott, Lynda and Mary Lynn (in no particular order). When our guys at the lab told us that it looked “very good”, my palms got a little sweaty. It’s their job to be critical, so it must look pretty darn awesome. Turns out it does. I feel so good about us getting this done. I’m sure YouTube will compress it and maybe we’ll lose a tiny edge of that greatness, but what arrived on our flash drive is grand — and it will be grand for posterity. An additional thank you to Tracy for taking the mp4 file we got back from the lab and boosting the volume a bit. The sound is SO much richer than what we’ve had in the past — I’m picking up all kinds of nuance that we didn’t have previously — but the volume needed a little help. **complete with RIDICULOUS and AWFUL Anita Louise and Unqualified-to-Speak-Male-Accomplice live Hazel Bishop commercials. My personal Hell, when I get there, ’cause there ain’t no doubt I’m going — ask around! — will consist of these on a loop, I am convinced. Okay I thought I was done with the commentary but can I just say that this dress is a lot cuter now that you can see the detail on it? It actually matches the pictures that were taken that night now, lol. She’s so cute. Here’s a lovely thing that we uncovered in the holdings of The JAM Project! 8mm film of Jeanette (and the members of the JMIFC) at the 1962 ClanClave — which was also the club’s 25th Anniversary. Most of you reading this will know the details of that weekend: Jeanette was directly involved in planning it, she gave a dinner for the group at The Luau restaurant (my friend Mary Lynn now has the check that paid for that meal…wild), she arranged for the group to tour MGM, have lunch in the commissary, etc. 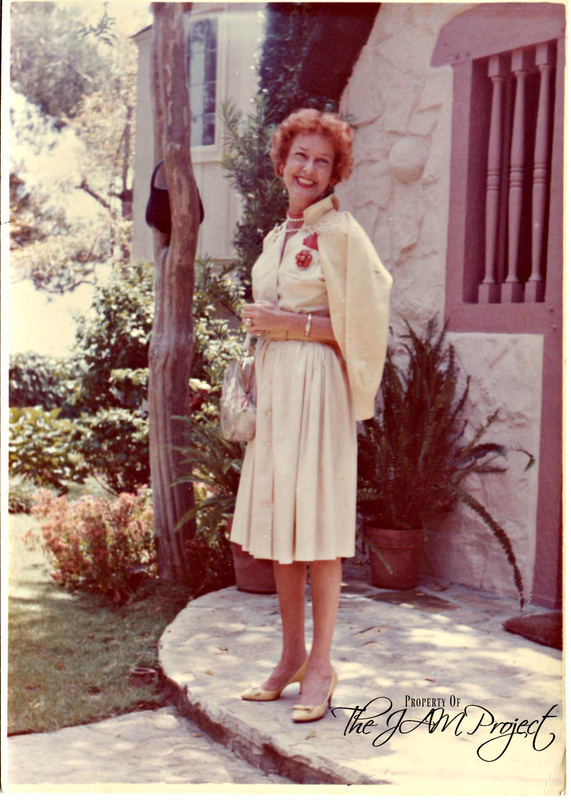 She invited everyone to Twin Gables, she posed for endless pictures… she was in general, generous, warm, delightful and perfect. We’ve had this footage digitized for several months, but did not ‘break’ it before now because we wanted to show it as a surprise at the Mac/Eddy Club meeting on June 25th in LA. One of our members, Sandy Laderas, was a speaker at the meeting, sharing photos and personal reminiscences of the weekend and of meeting Jeanette and how wonderful she was, so she and I collaborated and The JAM Project provided supplemental material for her presentation. Mary Lynn brought the check and I put together a small talk that consisted of reading Jeanette’s letters – both to the club and to club president Clara, privately – planning the weekend and presenting this footage — in which you can see the then-eighteen year old Sandy in several shots, which was so cool. Why would we celebrate a JMIFC event at the Mac/Eddy Club’s meeting? Because of Jeanette — because that weekend was so indicative of her public self, of her kindness and generosity to the people who had loved her for years. It was just nice. These were the young people who dogged her footsteps at the stage doors and train stations of the 40s. She was fond of them — she always made time for them. To enumerate Jeanette’s darling, wonderful interactions with her fans is to write an entire volume on the subject. They were a constant, unfailing source of love for her, to the extent that she kept up every kind of charade to allow them to maintain their illusions. It wasn’t deceit, it was selflessness. Jeanette was not a well woman in 1962 — and she hadn’t been for several years. She would not get better. After ’62, you can count her “public appearances” on a few fingers. Indeed, she left the group while they were touring her home so that she could go to the doctor — and though she downplayed it, and seemingly acted like it was a matter of routine, it’s pretty freakin’ weird that she’d have ‘scheduled’ something like that during this weekend, especially on a day when the group was in her home. One wonders what was really going on — and what this weekend cost her, in terms of health. Sandy Laderas speaks of Jeanette as not looking or acting ill, and, indeed, in the footage, other than Jeanette being extremely thin (her arms in the Luau footage especially give this away), she appears bubbly, charming and charismatic — exactly the way she’s ‘supposed’ to be; exactly the way fans would remember her from previous interactions. I noted that when she leaves the group at Twin Gables, she glides right up the stairs with effortless ease. She was on. She was a professional. She was a star. She was prideful. She was a classy woman, and a good one. She was not going to burden the group with her struggles. She was never going to let these people see her fall. It is absolutely consistent with everything Jeanette is that she be this way, and my inclination is to believe that if that doctor’s appointment could have been avoided, it would have been. So… something else was brewing. For me, this is an excuse to love her more — but knowing more all the time about the hell she kept to herself is heartbreaking. That ought to tell you a whole, whole lot. And comparing her letters to Clara versus things like her 1963 desk diary and various medical records we now have — Clara knew more than the average bear, perhaps, as in the above excerpt, but Clara was still firmly on a need-to-know basis. Here’s the footage. Enjoy this extraordinary human being, giving her very best to people who love her.